Perks such as complimentary Wi-Fi breakfast and parking plus close proximity to the area attractions and a heated outdoor pool are among the amenities our guests find at Quality Inn South Bluff. This two-story property has 96 rooms all featuring flat-panel TVs with premium cable microwaves refrigerators coffee/tea makers free Wi-Fi and weekday newspapers. Non-smoking accommodations are available by request. In the morning guests can start the day with a deluxe continental breakfast served on the house. 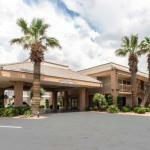 The hotel also has a heated outdoor pool hot tub coin-operated laundry and business center. Parking is complimentary. Quality Inn is three miles from Red Cliffs Mall and about two miles to Saint George Art Museum and Brigham Young's Winter Home. Tuacahn Amphitheater is seven miles away and Snow Canyon State Park is eight miles. Dixie State College is less than one-quarter mile from the hotel. Saint George Municipal Airport is 13 miles and Zion State Park is 35 miles.